These are two must-see shows for all content marketers! You work hard on your content and you want to get the most eyeballs on it that you can. It’s not enough to just create stellar content and then share it on social media the day it publishes. Content has a life cycle that you can dramatically extend by refreshing it constantly and promoting it on a schedule. Plus, watching your analytics can give you important feedback about what content to focus on most. 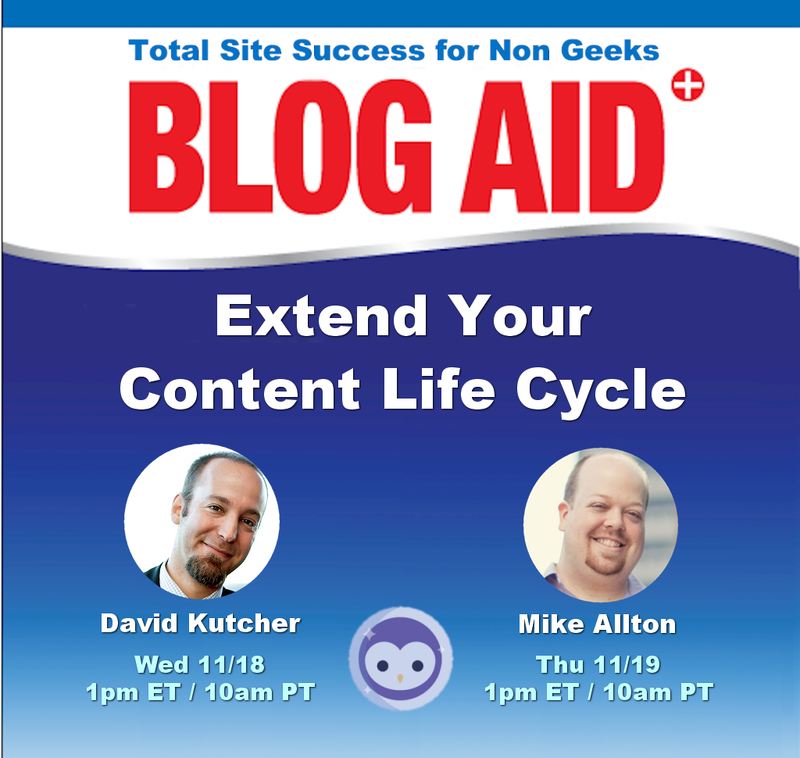 To help you extend your content’s life cycle, join me and special guests +David Kutcher and +Mike Allton for two important Blabs that you can’t afford to miss. And thanks to +Ana Hoffman for this link to Google’s advice about changing publish dates on posts. +David Kutcher is a web developer, information architect, content strategist, and the co-owner of Confluent Forms LLC, a boutique firm providing web design, web development, branding, graphic design and custom software development services. David is also my go-to guy for Google Analytics. +Mike Allton is a content marketing practitioner, author, and is the owner of The Social Media Hat and Chief Marketing Officer for SiteSell. Mike’s publications include The Unofficial Book on HootSuite and The Ultimate Guide to Writing Epic Content. Mike is my go-to guy for social media.